It's kinda crazy, the busy lives we live. Most if not all of you know what I mean. Might look like different things to different people, but at the base, there's a common truth - we're just busybusybusy people. Sandy and I are no exception. Both of us have more than fulltime jobs, a couple young kiddos, a house hitting the century mark this year (so lots of upkeep, and that doesn't even include the laundry), family, friends, errands...the list goes on. That's why I really treasure our weekend mornings. We make it a point to have at least one leisurely weekend morning meal, where we can actually sit down, chat, drink a couple cups of coffee, and just hang out for an hour or more. It's the best, and it's a great re-centering point for the week. It also helps that breakfast is probably our favorite meal, foodwise, so we usually go with the classics - eggs, bacon, sausage, pancakes, fruit, etc. Well, this past weekend we had only shot at this, on Sunday morning. I got roped into some early morning weekend OT at the day job, which preceded another busy day of errands (Huzzah Costco!) and kid-wranglin'. As mentioned on our new podcast, Let's Talk TJ's, Sunday morning is the best time to go shopping at TJ's, so we headed out early, pre-breakfast, with bacon on our mind. Then we saw this, Trader Joe's Pastrami Style Smoked Atlantic Salmon, and were intrigued enough to give it try. Make no mistake: this was a gamble. This was our one true laidback family meal of the week, and if the food stunk, that'd be a real stinker. 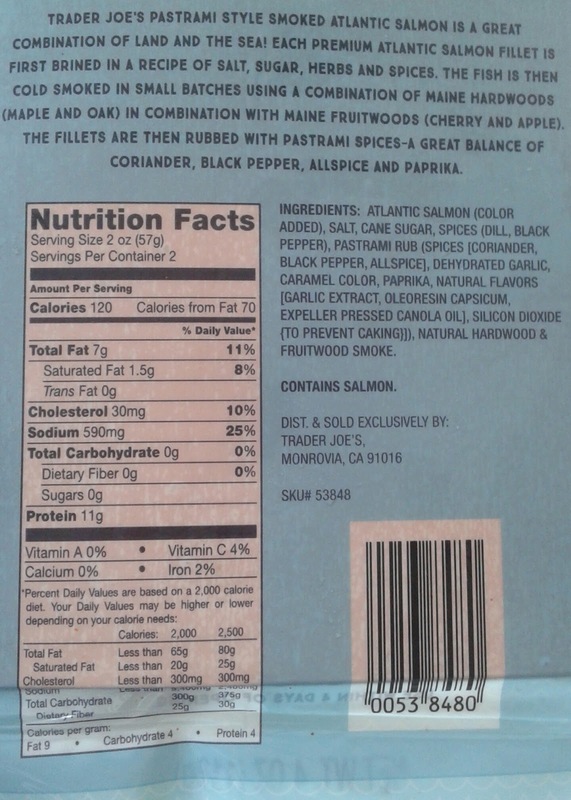 TJ's, in the history of our blog, doesn't have the shiniest track record with salmon products (like this or this). Plus...Sandy doesn't usually like salmon. Pink meat kinda creeps her out. It's only because this blatantly said "Pastrami Style" that she was willing to try it - she loves my dad's smoked pastrami (yes, I know, another pink meat) so semi-begrudgingly we got this, with a pack of bagels to make some sandwiches for a brunch with blueberries and coffee. Glad we rolled the dice. We both are very happy with the purchase. In the packages there's about eight or nine slabs of fresh fleshy fish a few inches long by maybe a millimeter or so thick, so just about the right amount for two decently-stacked sandwiches. The salmon is pretty clean and mild, for the most part. From my dad's aforementioned smoking prowess, I'm fairly certain I can tell the difference between different smoking wood chip varieties. For my part, I sensed more sweetness from the apple and cherry than depth from oak and maple, which isn't a bad thing for a meat like the steak that swims. 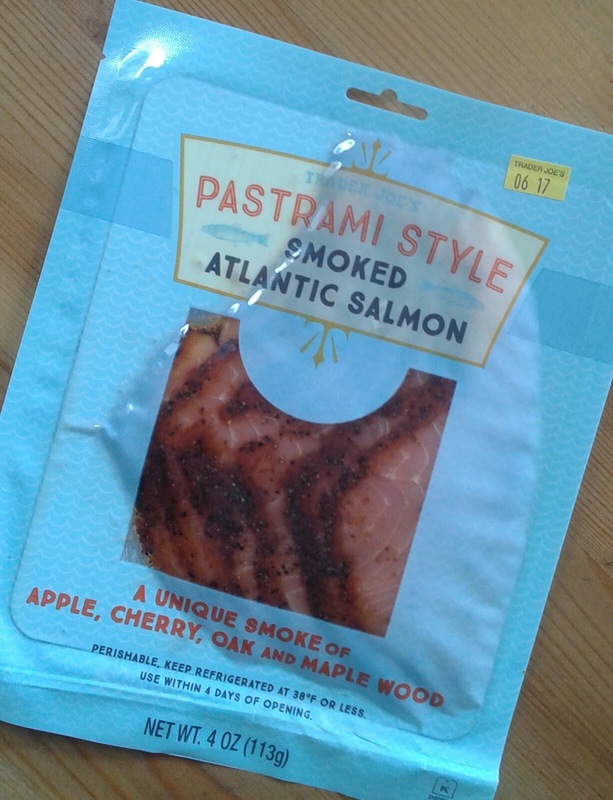 One thing not present throughout the salmon: all those pastrami spices. That's because all the black pepper and parika and whatnot were rubbed in post-smoking, not before. 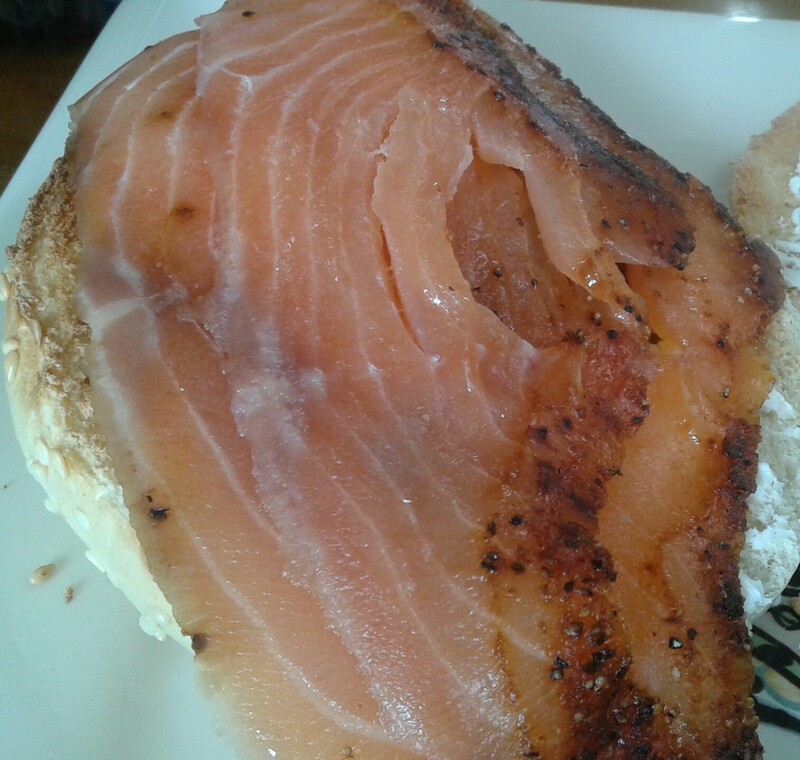 I'm thinking that's a good call, as we were able to enjoy both the sweet smokiness of "plain" salmon and the spicy peppery bite from around the edges in about equal measure. I'm not sure if this a brand new product, but it's definitely the first time we saw it. The four ounce package cost $4.99, about which I'm indecisive about the value. That equates to $20 a pound, so yeah...that's a lot. Then again, we're not frequent salmon purchasers, so maybe that's the going rate, but the curse of TJ's is I sometimes just expect an exceptional value, which I'm not convinced this is. Regardless, I'm glad we overcame our reservations to give our relaxed morning a little changeup Matching fours from the wife and me. I don't believe this is jerky - looks like run-of-the-mill smoked salmon to me, just with a tweak.to the spices. For $20 a pound, I expect wild salmon, not Atlantic (a.k.a. farmed salmon). 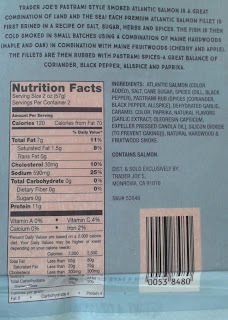 They do have one excellent wild smoked sockeye salmon at $9.99 for 1/2 pound or $17.99 for 1 pound. That's a pretty standard price for smoked salmon, which has a different cost to fresh salmon.